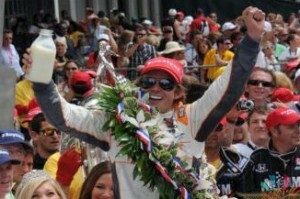 Dan Wheldon celebrates his 2011 Indianapolis 500 victory last May. On Oct. 16, the popular champion was killed during the Las Vegas Indy 300 race. LAS VEGAS – The racing world lost a legend as two-time Indianapolis 500 champion Dan Wheldon, 33, died of injuries he sustained in a fiery wreck on the 11th lap of the IndyCar Series finale at the Las Vegas Motor Speedway. The Las Vegas Indy 300 was billed as the series finale as Dario Franchitti and Will Power were scheduled to battle for the series championship amid a 34-car field. But on lap 11, 15 cars were involved in one of the most brutal wrecks in the history of open car racing. Wheldon’s car was one of three to go airborne and several caught fire as the race was red flagged. Power was also involved in the wreck and Franchitti was declared the series champion for the third straight year. Wheldon, from Emberton, England, was the 2005 IndyCar Series champion and won the Indy 500 in 2005 and this past May. He was the only driver to accept a $5 million challenge to win the race in Las Vegas as a non-regular driver in IndyCar. He was expected to replace Danica Patrick as the driver of the Go Daddy car next season when Patrick jumped to NASCAR. He won 16 races in his nine-year IndyCar career. Wheldon is survived by his wife and two young children. This entry was posted in Indianapolis, Indy 500, IndyCar, Wheldon. Bookmark the permalink.